Major General E. R. S. Canby in U.S. uniform. In 1861–1862, Canby commanded the Department of New Mexico, defeating the Confederate General Henry Hopkins Sibley at the Battle of Glorieta Pass, forcing him to retreat to Texas. At the war's end, he took the surrender of Generals Richard Taylor and Edmund Kirby Smith. As commander of the Pacific Northwest in 1873, he was assassinated during peace talks with the Modoc, who were refusing to move from their California homelands. He was the only United States general to be killed during the Indian Wars. Canby was regarded as an administrator, more than a leader. General Ulysses S. Grant believed that he lacked aggression, but declared him irreplaceable for his knowledge of army regulations and constitutional law. Canby was born in Piatt's Landing, Kentucky, to Israel T. and Elizabeth (Piatt) Canby. He attended Wabash College, but transferred to the United States Military Academy, from which he graduated in 1839. He was commissioned a second lieutenant in the 2nd U.S. Infantry and served as the regimental adjutant. Although often referred to as Edward Canby, a biographer has suggested that he was known as "Richard" during childhood and to some friends for most of his life. He was called "Sprigg" by fellow cadets at West Point, but during most of his career, he was generally referred to as E.R.S. Canby, sometimes signing his name "Ed. R.S. Canby." He married Louisa Hawkins at Crawfordsville, Indiana, August 1, 1839. She came from a family of three sisters and a brother, with whom she remained close. The Canbys had several children together. During his early career, Canby served in the Second Seminole War in Florida and saw combat during the Mexican–American War, where he received three brevet promotions, including to major for Contreras and Churubusco, and lieutenant colonel for Belén Gates. He also served at various posts, including Upstate New York and in the adjutant general's office in California from 1849 until 1851, covering the period of the territory's transition to statehood. Canby served in Wyoming and Utah (then both part of the Utah Territory) during the Utah War (1857–1858). During this period, he served on the panel of judges for the court martial of Captain Henry Hopkins Sibley. Sibley was acquitted. Subsequently, Canby wrote an endorsement for a teepee-like army tent which Sibley had adapted from the American Indian style. Both officers were later assigned to New Mexico, where in 1860 Canby coordinated a campaign against the Navajo, commanding Sibley in a futile attempt to capture and punish Navajo for "depredations" against the livestock of settlers. The campaign ended in frustration, with Canby and Sibley rarely sighting Navajo raiders. Usually they saw the Navajo at a distance and never got close to them. At the start of the Civil War, Canby commanded Fort Defiance, New Mexico Territory. He was promoted to colonel of the 19th U.S. Infantry on May 14, 1861, and the following month commanded the Department of New Mexico. His former assistant Sibley resigned to join the Confederate Army, becoming a Brigadier General. Although Sibley's Army of New Mexico defeated Canby and his troops in February 1862 at the Battle of Valverde, Canby eventually forced the Confederates to retreat to Texas after the Union's strategic victory at the Battle of Glorieta Pass. Immediately following this battle, Canby was promoted to brigadier general on March 31, 1862. Recombining the forces he had earlier divided, Canby set off in pursuit of the retreating Confederate forces, but he soon gave up the chase and allowed them to reach Texas. Shortly after the failure of the Confederate invasion of northern New Mexico, Canby was relieved of his command by Gen. James H. Carleton and reassigned to the east. Canby's achievement in New Mexico had largely been in his planning an overall defensive strategy. He and his opponent, Sibley, both had limited resources. Though Canby was a little better supplied, he saw that defending the entire territory from every possible attack would stretch his forces too thinly. Realizing that Sibley had to attack along a river, especially since New Mexico was in the middle of a long drought, Canby made the best use of his forces by defending against only two possible scenarios: an attack along the Rio Grande and an attack by way of the Pecos and Canadian rivers. He could easily shift the latter defensive force to protect Fort Union if the enemy attacked by way of the Rio Grande, which they did. Canby persuaded the governors of both New Mexico and Colorado to raise volunteer units to supplement regular Federal troops; the Colorado troops proved helpful at both Valverde and Glorieta. In spite of occasional superior soldiering by Confederate troops and junior commanders, Sibley's sluggishness and vacillation in executing a plan with high risk led to an almost inevitable Confederate collapse. After a period of clerical duty, Canby was assigned as "commanding general of the city and harbor of New York City" on July 17, 1863. This assignment followed the New York Draft Riots by ethnic Irish against blacks, which caused numerous deaths and extensive property damage. He served until November 9, reviving the draft, and overseeing a prisoner of war camp in New York Harbor. He then went to work in the office of the Secretary of War, unofficially describing himself in correspondence as an "Assistant Adjutant General." Looking back on Canby's record, a 20th-century adjutant general, Edward F. Witsell, described Canby's position as "similar to that of an Assistant to the Secretary of the Army." In May 1864, Canby was promoted to major general and relieved Nathaniel P. Banks of his command at Simmesport, Louisiana. He next was assigned to the Midwest, where he commanded the Military Division of Western Mississippi. He was wounded in the upper thigh by a guerrilla while aboard the gunboat USS Cricket on the White River in Arkansas near Little Island on November 6, 1864. Canby commanded the Union forces assigned to conduct the campaign against Mobile, Alabama in the spring of 1865. This culminated in the Battle of Fort Blakely, which led to the fall of Mobile on April 12, 1865. Canby accepted the surrender of the Confederate forces under General Richard Taylor in Citronelle, on May 4, 1865, and those under General Edmund Kirby Smith west of the Mississippi River on May 26, 1865. Canby was generally regarded as a great administrator, but he was criticized as a soldier. Ulysses S. Grant thought him not aggressive enough. At one time, Grant sent Canby an order to "destroy [the enemy's] railroads, machine-shops, &c." Ten days later, Grant reprimanded him for requesting men and materials to build railroads. "I wrote... urging you to... destroy railroads, machine-shops, &c., not to build them", Grant said. Canby could be a destroyer but appeared to prefer the role of builder. Today, he might be considered a "policy wonk" because he was expert in policy and law. If someone had a question about army regulations or Constitutional law affecting the military, Canby was the man to see. Grant came to appreciate this in peace time, once complaining vigorously when President Andrew Johnson proposed to assign Canby away from the capital where Grant considered him irreplaceable. General Canby is very active, but his work makes no great show as yet, because it is conducted too quietly and without ostentation. Canby is a tall man of thoughtful and kind face – speaks little and to the point – thoroughly a soldier and his manner is very modest and unassuming and sometimes even embarrassed. Canby's father had once owned slaves. Some of Canby's cousins fought for the Confederacy, and one was taken prisoner. The man's father wrote to Canby asking the general to use his influence to parole his son, but Canby declined, responding that he did not feel entitled to use his influence to benefit family members. Later, when Canby was a military governor during Reconstruction, he declined to favor relatives who had become carpetbaggers in his jurisdiction. After the war, Canby served as commander of various military departments during Reconstruction, as the government tried to manage dramatic social changes while securing peace. He commanded Louisiana from 1864 to May 1866. He was next assigned as commander of the Department of Washington, which consisted of Delaware, Maryland, the District of Columbia, and Alexandria and Fairfax counties in Virginia, from June 1866 until August 1867. He was assigned to the command of the Second Military District, comprising North and South Carolina. In August 1868, he briefly resumed command in Washington. He was assigned to the Fifth Military District in November, where he focused primarily on the reconstruction of Texas. He left Texas for Virginia, the First Military District, in April 1869, serving there until July 1870. Each of these postings occurred during Reconstruction and put Canby at the center of conflicts between Republicans and Democrats, whites and blacks, state and federal governments. New state legislatures were writing constitutions, and the social climate was highly volatile, with insurgent attacks against freedmen and Republicans on the rise in numerous areas. Many of his districts had Ku Klux Klan chapters, which the US government was not able to suppress until the early 1870s. Canby sometimes alienated one side or the other and often both. Charles W. Ramsdell called Canby "vigorous and firm, but just." Even political opponents, such as Jonathan Worth, governor of North Carolina, admitted that Canby was sincere and honest. In August 1872, Canby was posted to command the Pacific Northwest. He soon faced problems with the Modoc tribe, who had traditionally lived in Northern California. 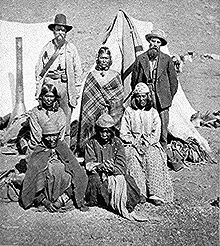 Forced to remove to a reservation in Oregon which they had to share with their traditional enemies, the Klamath tribe, they had pleaded with the US government to return to California. When the US refused, the Modoc left the reservation and returned illegally. In 1872, the US Army went to fight against them to force them back and the Modoc War broke out. The Modoc, entrenched in Captain Jack's Stronghold south of Tule Lake, resisted army attacks and fought US forces to a stalemate. General Canby had received conflicting orders from Washington as to whether to make peace or war on the Modoc. As war was not working, the US government authorized a peace commission and assigned Canby a key position on it. There were many lines of communication between the Modoc and whites. At one point, someone told the Modoc leader Captain Jack that the governor of Oregon intended to hang nine Modoc, apparently without trial, as soon as they surrendered. The Modoc broke off scheduled talks; Canby was angered by the rumors and their action, as he believed that his federal authority trumped the governor's and made the threat irrelevant. Canby had no intention of allowing the Modoc to be punished without a trial. On April 11, 1873, after months of false starts and aborted meetings, Canby went to another parley, unarmed and with some hope of final resolution. Judge Elijah Steele of Yreka, California wrote later that when he warned Canby that the Modoc were volatile and he was at risk, Canby replied, "I believe you are right, Mr. Steele, and I shall regard your advice, but it would not be very well for the general in command to be afraid to go where the peace commissioners would venture." The peace talks were held midway between the army encampment and Captain Jack's stronghold near Tule Lake. It was discovered later that two members of Canby's party brought concealed weapons and Modoc warriors were also armed. According to Jeff C. Riddle, the Modoc son of the US interpreter and the author of Indian History of the Modoc War (1914), the Modoc had plotted before the meeting to kill Canby and the other commissioners, as they believed peace was not possible. They were determined to "fight until we die." (He was the son of Winema and Frank Riddle.) Captain Jack had been reluctant to agree to the killings, believing it "coward's work", but was pressured by other warriors to agree. He insisted on being given another chance to ask Canby to "give us a home in our country." When Canby said he did not have the authority to make such a promise, Captain Jack attacked the general. With Ellen's Man, one of his lieutenants, he shot Canby twice in the head and cut his throat. The Modoc also killed Reverend Eleazar Thomas, a peace commissioner, and wounded others in the party. Canby was the only general to be killed during the Indian Wars. Following Canby's death, national outrage was expressed against the Modoc. 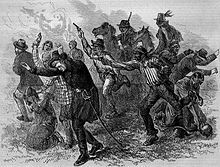 Eastern newspapers called for blood vengeance, except for one in Georgia, which headlined the story: "Captain Jack and Warriors Revenge the South By Murdering General Canby, One of Her Greatest Oppressors." E.C. Thomas, son of the murdered peace commissioner, recognized the inevitability of reprisals for the killings, but said: "To be sure, peace will come through war, but not by extermination." Eventually, Captain Jack (Kintpuash), Boston Charley, Schonchin John, and Black Jim were tried for murder, convicted, and executed on October 3, 1873. The surviving Modoc were sent to reservations. The killing of Canby, and the Great Sioux War, undermined public confidence in President Grant's peace policy, according to the historian Robert Utley. There was growing public sentiment for full defeat of the American Indians. After memorial services were performed on the West Coast, Canby's body was returned to Indiana and buried in Crown Hill Cemetery, Indianapolis, Indiana on May 23, 1873. 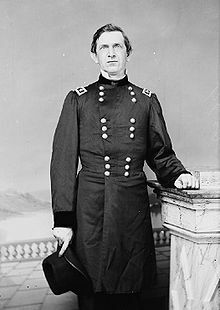 At least four Union generals attended his funeral there: William Tecumseh Sherman, Philip Sheridan, Lew Wallace, and Irvin McDowell, and the latter two served among the pall bearers. A reporter noted that, although the funeral procession was generally reserved, "more than once, expressions of hatred toward the Modoc" marred the silence. 1871, he was awarded an honorary degree by Wesleyan University of Middletown, Connecticut. 1875, Fort Canby, a coast defense installation guarding the entrance to the Columbia River, is named in his honor. 1880s, Canby's Cross was erected in his honor near the site of the peace talks, in the area later designated as the Lava Beds National Monument. The towns of Canby in Clackamas County, Oregon, Canby in Yellow Medicine County, Minnesota, and Canby in Modoc County, California, are named for him. Canby, Oregon's annual July 4th celebration used to be called General Canby Days, with activities including a pancake breakfast, car show, parade and music. ^ Jones Archer (11 May 2010). Civil War Command And Strategy: The Process Of Victory And Defeat. Simon and Schuster. p. 215. ISBN 978-1-4391-0581-8. ^ United States. War Dept; Robert Nicholson Scott; Henry Martyn Lazelle; George Breckenridge Davis; Leslie J. Perry; Joseph William Kirkley; Fred Crayton Ainsworth; John Sheldon Moodey (1897). The War of the Rebellion: A Compilation of the Official Records of the Union and Confederate Armies. U.S. Government Printing Office. p. 875. ISBN 978-0-918678-07-2. ^ Mattson, Lu. Shaman's Dream: The Modoc War. Retrieved 2015-07-31. ^ Chicago and North Western Railway Company (1908). A History of the Origin of the Place Names Connected with the Chicago & North Western and Chicago, St. Paul, Minneapolis & Omaha Railways. p. 51. ^ "Home". Retrieved 27 September 2018. Heyman, Max L., Jr.: Prudent Soldier: A Biography of Major General ERS Canby, 1817-1873, Frontier Military Series III, Glendale, California: The Arthur H. Clark Co., 1959. "Canby, Edward Richard Sprigg, 1819[sic]-1873. Papers, 1837-1873", A\C214 (1 box, 146 items; Filson Historical Society Library: MS #118, includes contemporary newspaper accounts regarding General Canby's death and its aftermath). Wikimedia Commons has media related to Edward Canby.